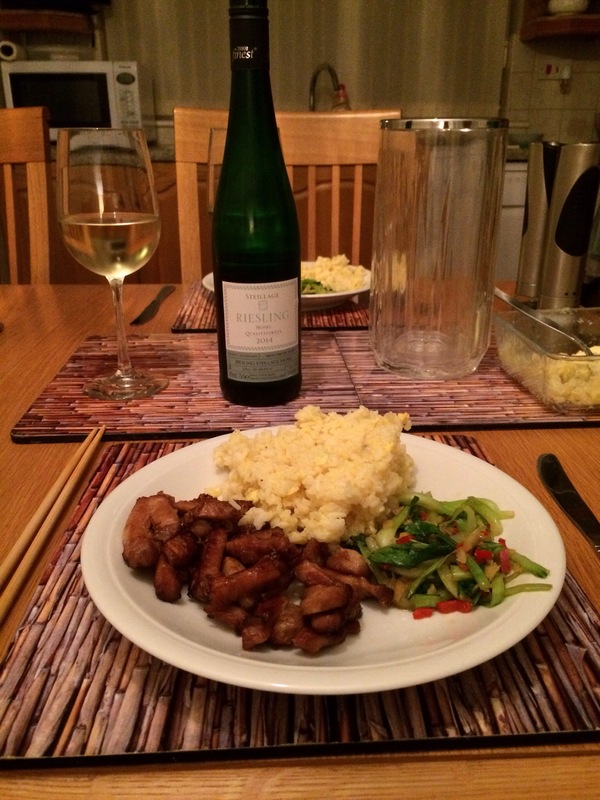 We wanted to slow-cook some pork belly and found a Heston Blummenthal recipe on the Waitrose website. 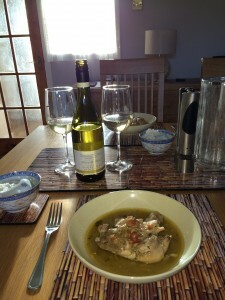 The pork is cooked with carrots, parsnips, turnip, garlic, chicken stock and sage. 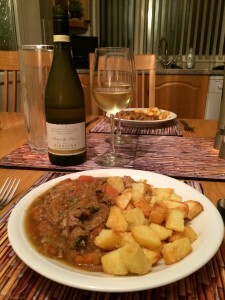 However, we modified the recipe by using the slow cooker rather than the oven and dispensed with the crackling and the parsnips. We served the pork with roast potatoes. We thought a dry Riesling would be good with the pork and opened a bottle of Peter and Peter Riesling 2013, an off-dry German white from Tesco. 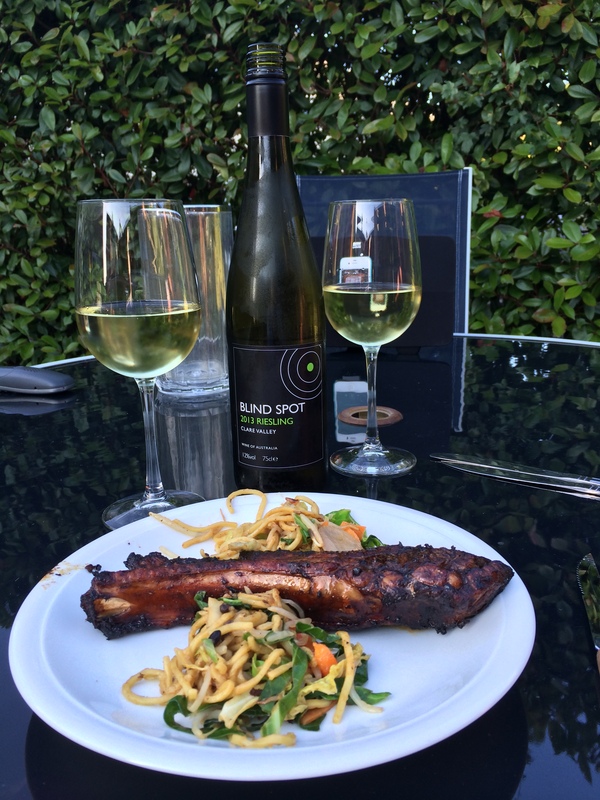 We were surprised that this wine didn’t work with the meal and we set it aside. 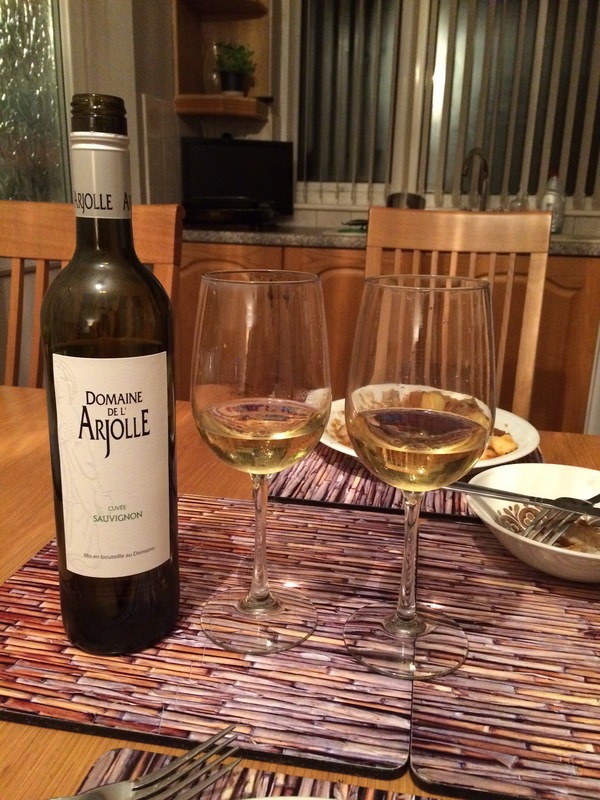 We turned to a bottle of Domaine de l’Arjolle Sauvignon Blanc 2012, a Southern French white from the Wine Society. 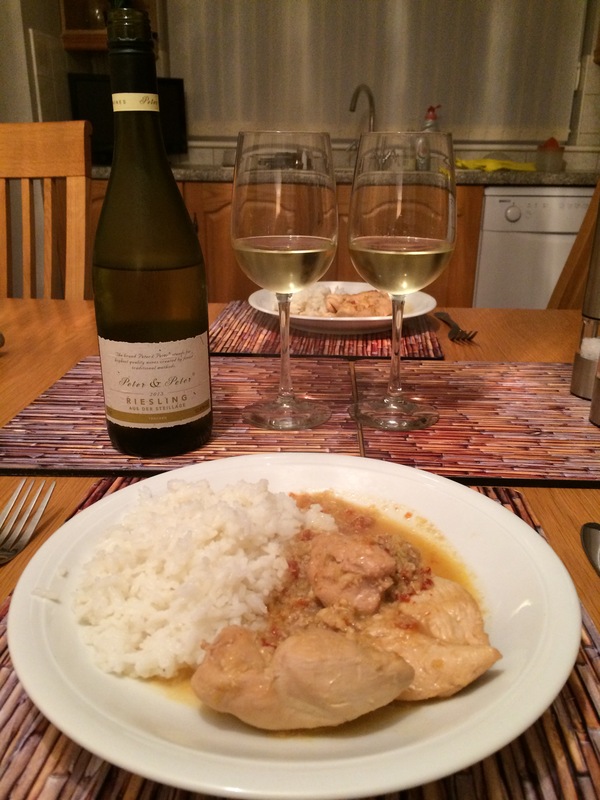 There was a slight sweetness, with apples, a creamy smoothness and a slightly tangy grapefruit finish. The wine successfully cut through the fat and was a good match with the meal. 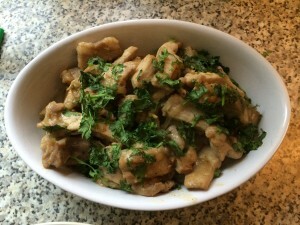 For quick midweek meals we’ve cooked a couple of Chinese stir-fried chicken dishes recently. 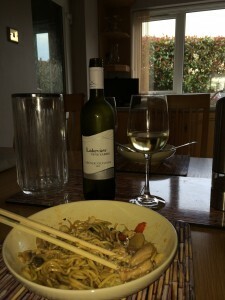 In the first we stir-fried the chicken with light soy sauce, carrots, pak choi, white cabbage, red onion, mushrooms, red pepper, bean sprouts, water chestnuts, garlic and ginger. To this mixture we added Tesco’s Sweet Chilli and Ginger stir-fry sauce that also contains yellow bean and garlic. We served this with sesame oil egg noodles. 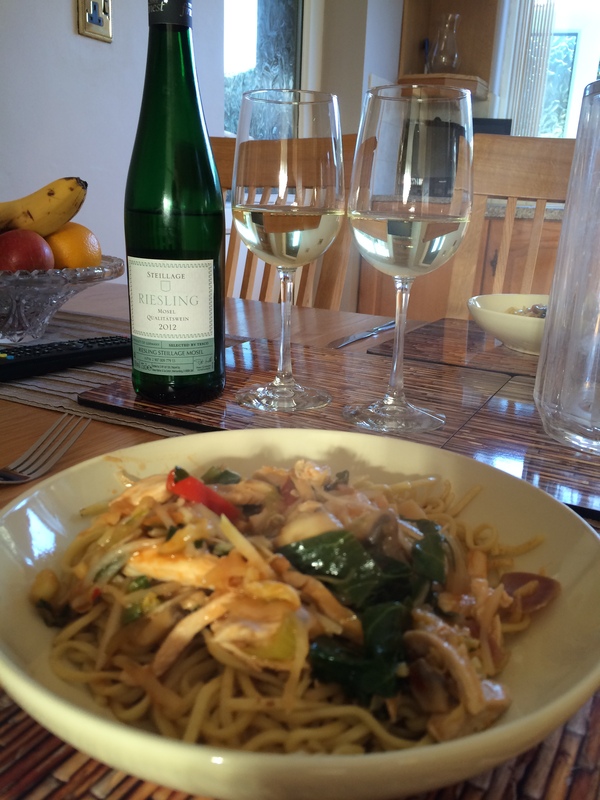 The sweet flavours in this dish called for a medium-dry white wine and fortunately we had a suitable bottle in the fridge – Steillage Riesling Mosel Qualitätswein 2012 from Tesco’s Finest range. 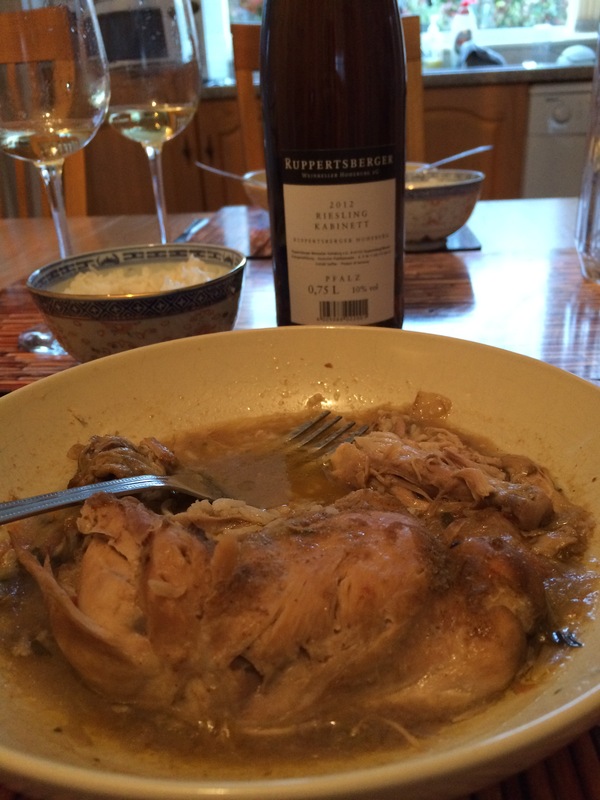 This German white was pale gold in the glass and fresh with good minerality. We tasted pineapple and other tropical fruits with a creamy sweetness. 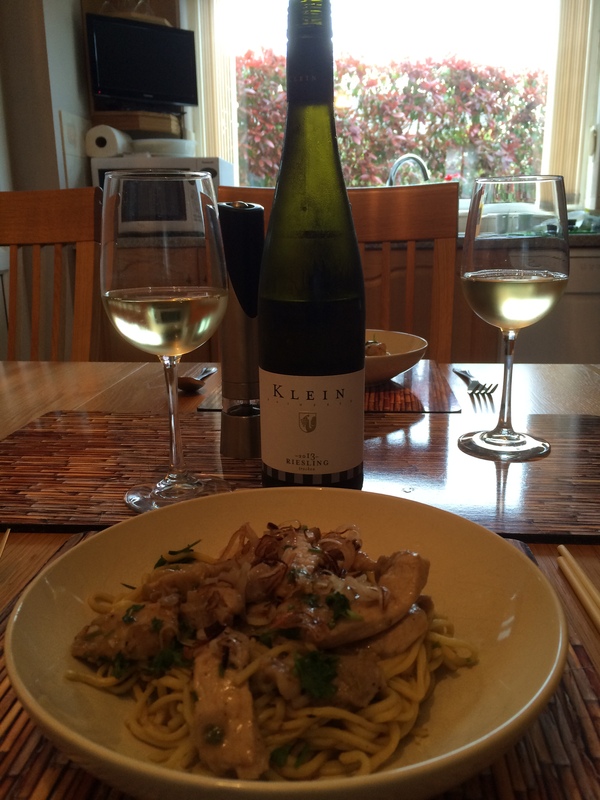 An excellent match with an enjoyable stir-fry. 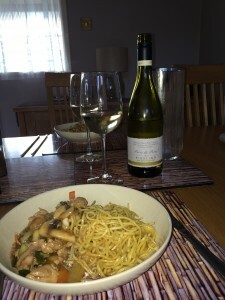 The second stir-fry combined chicken with the same vegetables, but this time we added Tesco’s Chinese stir-fry sauce, which contains soy, ginger, garlic and five-spice. We also served this with sesame oil egg noodles. We found the flavours of this stir-fry to be a little bland and overall disappointing. 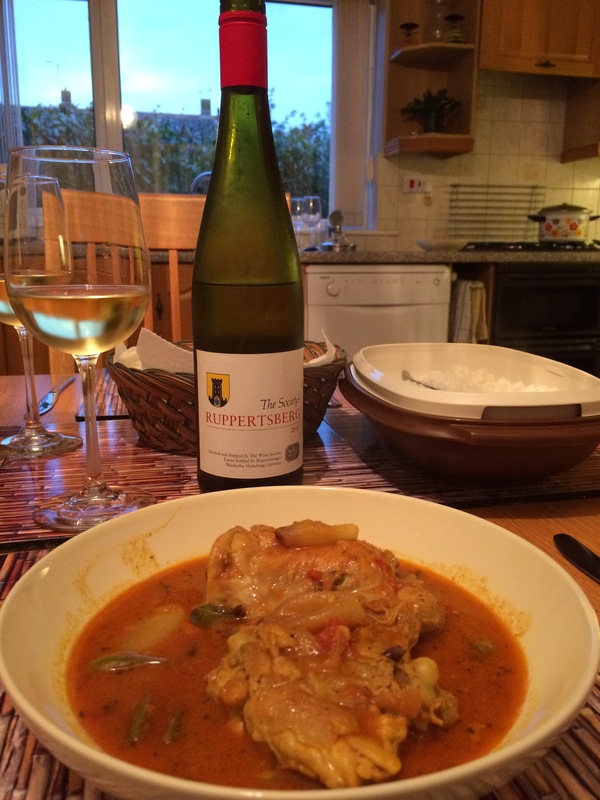 There was a slight sweetness in this dish, so we opened a bottle of Peter & Peter Riesling 2013, an off-dry German white from Tesco. However, we quickly concluded this was a lacklustre match and set it aside. We decided to try a a dry white from Hungary – Lakeview Grüner Veltliner 2012, also from Tesco. 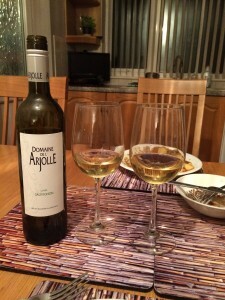 This was clean tasting with peach and apple flavours and hints of tropical fruits. 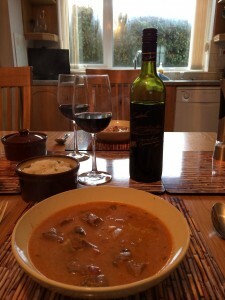 However, it was no more than an adequate match with the meal. We are looking forward to achieving better food pairings for these wines in future. 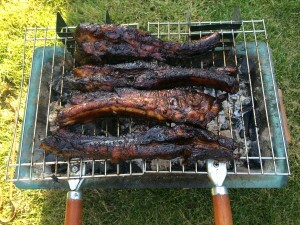 We cooked Barbecued Spareribs from Supercook. 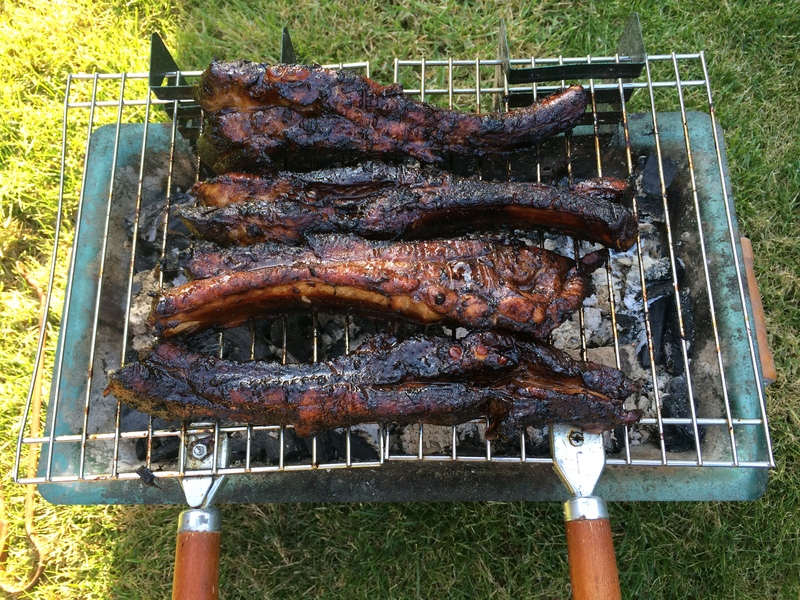 The pork ribs were baked in a sweet and sour sauce of garlic, onions, tomato purée, lemon juice, sage, brown sugar, beef stock and mustard. We served them with a jacket potato and salad. 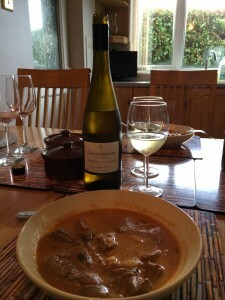 Kathryn McWhirter and Charles Metcalfe, the authors of our ancient but trusty Sainsbury’s Pocket Food and Wine Guide recommend Liebfraumilch as the star pairing, which may possibly horrify some wine snobs who would not go near the stuff. However, our prime objective is to achieve and share good wine and food matches and we like many German wines anyway. We opened a bottle of Liebfraumilch Qualitätswein Rheinhessen 2012 St Amandus Riesling, Kerner-Silvaner, Müller-Thurgau from Aldi . 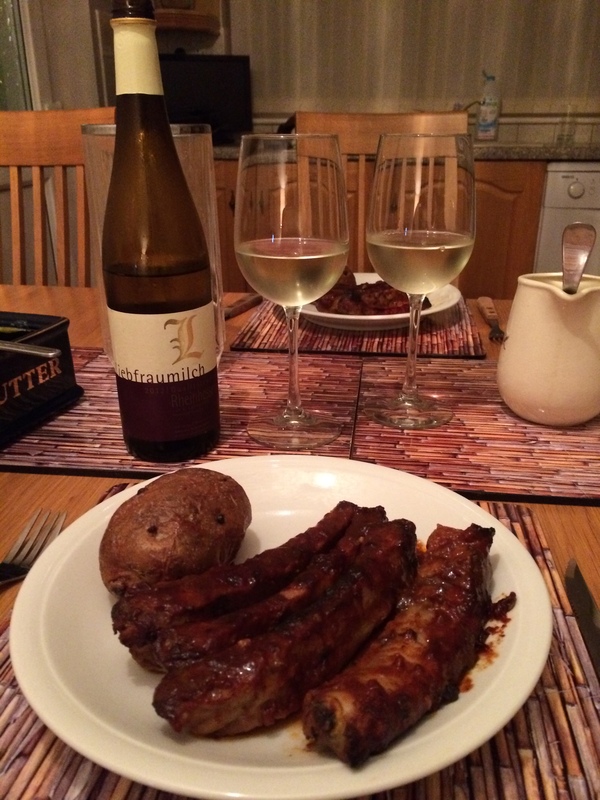 This medium-dry white had creamy flavours of pears and pineapple and was a very good match with the spareribs.